DOMITE (700 BHN) products are made in Australia by the CQMS Group. This unique product was originally created for the Australian mining and quarrying industries by Mason & Cox Foundries in 1967. Today the DOMITE range of products is manufactured and distributed to worldwide markets from facilities in Queensland Australia. DOMITE products are marketed across the globe through a network of dedicated dealers with WEARCO being one of its representatives. Over the years the DOMITE has developed into a range of over 3,000 different shapes and sizes for a wide variety of applications. As well as DOMITE, WEARCO supplies other wear resistant composite products known as REMAR (a reinforced white iron), and RUBBADEX (a rubber/steel backed noise reduction wear plate). All these products are designed to withstand high impact and provide maximum wear resistance in the mining, earthmoving, construction, dredging, crushing, sugar and recycling industries. For any wear solution WEARCO is able to offer its customers, full design, layout and assembly of all DOMITE products. Designs can incorporate other wear products such as ceramics, wear resistant rubbers and polymers, sintered Tungsten carbide enhanced products, QT or AR plate, clad or overlay plate and wear resistant castings and alloys. All this is available from WEARCO as a “one stop shop” for all your abrasion resistant product needs. This product has long been the most popular wear item in the DOMITE range. The DOMITE (700 BHN) Chocky Bar was developed many years ago as an alternative to expensive, labour intensive, hard facing welding methods. Chocky bars are so easy to use! No storage problems or excessive cutting into strips required when compared to sheets of wear plates. There is also no pre-heating or post heating required when welding DOMITE bars into place. DOMITE Chocky Bars are easy to cut and form onto inside and outside contoured surfaces. 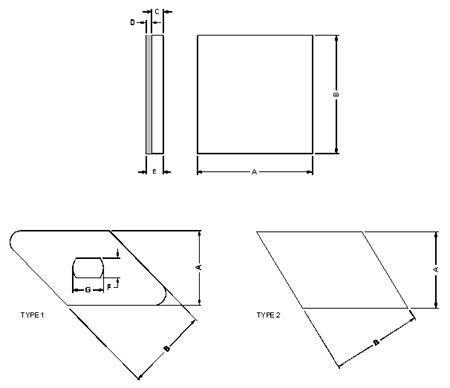 Users can calculate their own lay-outs and patterns depending on the area and shape of the parts that they want to protect. The notches in the Chocky Bar casting and/or backing plate assist in cutting them to size or bending them to shape to suit the application. Talk to us about the use of DOMITE Chocky Bars for your particular application. Chances are someone is already using it successfully for that same application somewhere around the world. 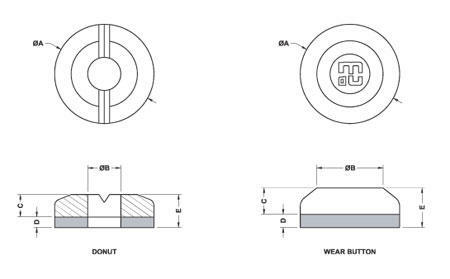 DOMITE (700 BHN) Wear Buttons and Donuts are the perfect alternative to expensive, labour intensive hard facing or the need to cut wear strips from full sheets of wear plate. Available in diameters from 60mm up to 150mm. Develop your own layout and pattern to suit your particular wear protection solution. Talk to us about how to effectively use these parts for applications ranging from specific wear protection on buckets and GET for loaders, excavators and draglines, to conveyor transfer points and chutes. DOMITE Wear Buttons are easy to use and install with no pre or post heating. WEARCO has a huge selection of wear plates from which to choose. DOMITE (700 BHN) Wear Plates are available in thicknesses ranging from 20mm to 75mm and in sizes up to 500mm square. Suitable for use in chutes, hoppers, bins, impact walls, screen plates, and general wear protection in many proven Fixed Plant applications. To cover large areas with DOMITE requires a planned layout using liners of various shapes and sizes which are available from WEARCO’s extensive range. With your input, WEARCO can do all your design work for liner layouts and installations. DOMITE Wear Plates are easy to use and install. They can be welded or can be stud bolted to suit your fitment needs. Talk to WEARCO about the range of stud bolt options available and how we can design, manufacture and supply your specific liner needs. DOMITE Wear Plates offer superior wear life when compared to conventional alloys used such as manganese steel, ni-hard alloys, chrome-moly pearlitic steels, Q&T bars and clad overlay strips. DOMITE Wear Plates provide the ability to change out worn sections only, rather than replacing whole sheets or plates. DOMITE Wear Plates and other DOMITE products present a very cost effective method of extending wear life of the machinery you want protected. DOMITE (700 BHN) Wear Bars and Blocks are available in thicknesses ranging from 25mm to 100mm, widths from 25mm to 300mm wide and in varying lengths. Let us know what size or dimensions that you want, if we don’t have it, we will make it for you. Suitable for use in chutes, hoppers, bins, transfer points, rock box edges and many other proven Fixed Plant applications. DOMITE Wear Bars and Blocks are easy to use and install using the DOMITE® Welding Instruction. 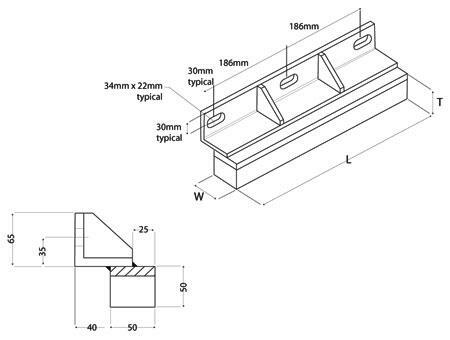 DOMITE Wear Bars and Blocks can be stud bolted to suit your fitment needs. 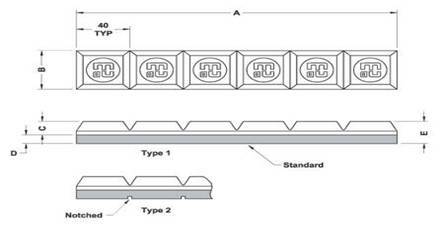 Talk to us about the range of Studded wear bars we can offer. DOMITE Wear Bars and Blocks offer superior wear life when compared to conventional alloys used such as manganese steel, ni-hard alloys, chrome-moly pearlitic steels, Q&T bars and clad overlay strips. DOMITE Wear Bars and Blocks give the ability to be able to change out worn sections only, rather than replacing whole sheets or plates. DOMITE Wear Bars and Blocks offer a very cost effective method of extending wear life of the machinery you want protected. DOMITE (700 BHN) Micro-ledges were developed to reduce the weight of liners for bins, hoppers, and chutes required for a specific installation. Each installation requires a layout and pattern specific to the customers needs. Please contact WEARCO for assistance and advice on how we can save you money when installing DOMITE Micro-ledges. A new innovation using a “one size fits all” concept for chute, bin and hopper linings! DOMITE (700 BHN) Star Plate – the multi-shaped wear resistant plate. The Star plate concept is based on using one size for most applications to suit chute, bin, hopper, bucket and truck bed linings. It offers a very cost effective, extremely long wear life alternative to standard chrome-carbide clad sheets and AR wear plates which have to be cut and shaped using special tools and equipment.